While all the current Windows Phone owners and those who are planning to buy one are in confusion as to whether their devices will get an upgrade to the much-awaited Windows Phone 8 (Apollo) on their devices or not, here’s some good news. According to an interview, with Portuguese forum Zwame, Microsoft evangelist Nuno Silva, said that Windows Phone 8 (Apollo) will be coming to all current phones. If you ask which devices are included in the ‘current phones’ list, then according to Nuno, it includes all Windows Phone devices since the first generation of LGs and Samsungs, like the Omnia 7 and the rest. So this is indeed good news for all the older Windows Phone owners. The only minus with this upgrade reaching the older devices is that they will not be able to take full advantage of the OS, since according to the previous list of leaks about the WP8 (Apollo), the OS will go on to bring in support for screens with higher resolution, dual-core processor and more. And now for the bummer! TheVerge is reporting that sources close to Microsoft are telling them that there are no chances of any Mango running devices of getting the WP8 Apollo update. Now this may not go on smooth with all the users who have just bought a new Windows Phone from Nokia or any other manufacturer as they will be limited to WP Mango only. 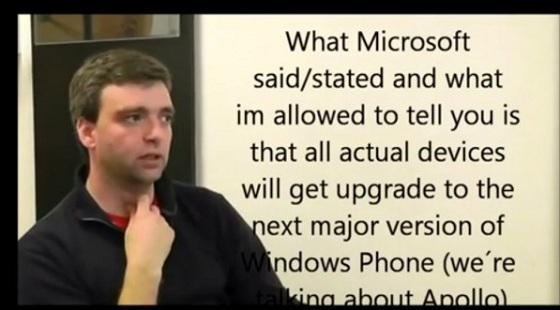 Well as for now, we just can’t say or believe anything, until Microsoft makes it official, if the devices will get an upgrade or not. And we’ll wait till then.